If you hate failure or work very hard avoid it you will likely live a safe but boring life. It is likely that you won’t succeed. If you embrace it and accept that failure is something you can learn from, take advantage of and stretch yourself. Failure develops character. It is an indicator of your “intestinal fortitude” – your willingness to take risk or even just take action. Any type of innovation will usually require failure. It is possible to use failure to your benefit. 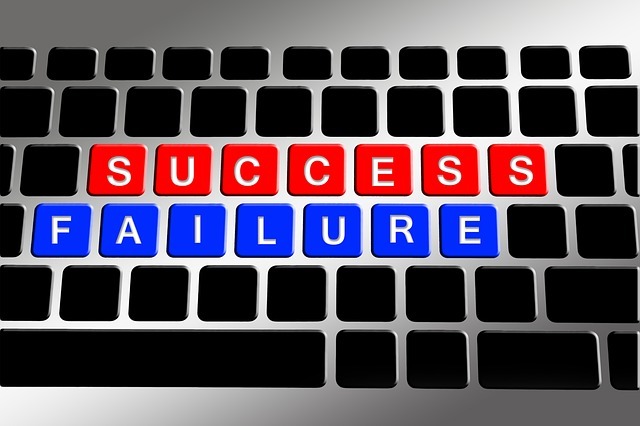 Failing indicates that you are trying, and the more you try the better chance you have for long-term success. Fail quickly. It is better to discover something does not work sooner rather than later. You don’t want to waste your valuable time on something that is not going to work. You do need to give your idea/premise/whatever a fair chance to be successful. Give yourself a time frame for your idea (i.e. 1 month, 6 months, 1 year etc.) and then evaluate it. Evaluate the reasons for failing. Do you have the time, energy and resources to ensure that your idea is implemented? It is important to evaluate where you went wrong. Was the issue the idea itself or in the execution? Can you change your approach? Don’t repeat your failures. Many people make the same mistakes over and over. Choose to fail differently each time by learning from each of your failures. This allows you the opportunity to improve your approach. Evaluate your failure. After you recognize that you have a failure it is important to stop and take the time to evaluate it. Giving up and going off to potentially repeat that failure in the future is a waste of your time. Make a list of everything you learned. Determine how can you apply that information in the future. Ask yourself what is the next logical step? I don’t know anyone who likes to fail. So make sure you get the most out of your mistakes. Consider keeping a journal to record your discoveries and new ideas. Next time, you can use this valuable information to improve or even succeed! Mindset check. It is important check your perspective. When you are deep into something and experience a failure it can seem like “everything” is “ruined”. Remember that you and your self-worth is not based on your results. Failure is simply an undesired result. It’s not a measure of your intelligence, worth, or future. As hard as it can be in the moment, you don’t have to take it personally. Make sure you acknowledge yourself for your bravery in taking action. Don’t play the blame game. There is a difference between failure and fault. Finding fault and placing blame is a way to judge yourself and make yourself, and others, wrong. It’s really hard to learn anything under these circumstances. Use failure to determine how to improve for the next time. Fail on purpose. What do you want to learn about? What are you trying to achieve? What will failing allow you to learn about? The best learning experiences allow you to move closer to you desired goal. The more challenging the goal, the more times you can expect to fail before achieving success. When you are able to fail effectively you create new opportunities. Consider how many of the most important inventions resulted from mistakes. Post-it note glue resulted from a failure to create a super-strong adhesive. Don’t beat yourself up for failing. It doesn’t get you any closer to your goal and it prevents you from actually getting the most out of your failure. Each failure can actually be a step in the right direction. Accept that failure will happen. Embrace it. Learn from it. Confidently take action and make sure that you fail effectively!